Sleaford Town once again gave fans full value for money as they came out on top of a 10-goal bonanza at Kirby Muxloe on Saturday. 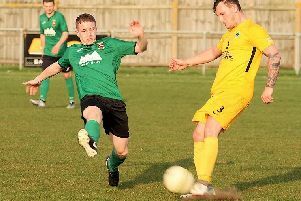 Town’s last four games have garnered 25 goals - 12 of them flying into their opponents’ net – and they made a blistering start at the United Counties League Premier strugglers. Jamie Shaw’s side scorched into a 5-1 lead at half-time on their way to a 7-3 win which moved them up to 13th. The visitors were ahead within six minutes in Leicestershire through Archie Moyses’ 20-yard free-kick, and doubled their lead just four minutes later when George Coupland converted Newman’s cross. Town hadn’t had things all their own way, and having gone close already, Kirby made it 2-1 in the 12th minute and went on to enjoy a good spell. But two goals in as many minutes just before the half-hour mark put Sleaford in command as a mistake from the Kirby keeper allowed Oliver to make it 3-1 before Coupland claimed his second of the afternoon. And Coupland then turned provider on the stroke of half-time, his cross teeing up Oliver for his brace. After a manic first half, the pace didn’t drop at the start of the second as Kirby came out looking to respond. The hosts soon had an effort disallowed, but had to wait until the 71st minute to reduce the deficit. Befitting the afternoon, Hockin then smashed in a free-kick from fully 30 yards just five minutes later, but Kirby responded again from the penalty spot to make it 6-3 with 10 minutes left. But it was the Green Army who had the final say when Coupland completed his hat-trick - and 10th for the season – with a twice-taken penalty. Next up for Town is the visit of fifth-placed Holbeach United to Eslaforde Park on Saturday (kick-off 3pm).